Thinking about buying a green cheek conure? The green cheek conure is one of the most popular of the parrot family. This little parrot is easy-going and great for a child's first pet. It is quieter than many of the other parrots and it has a lower voice. It is also more gentle and not as likely to bite unless scared or hurt. With time and patience, it can also be taught to talk. Let's find out more about this lovely bird. 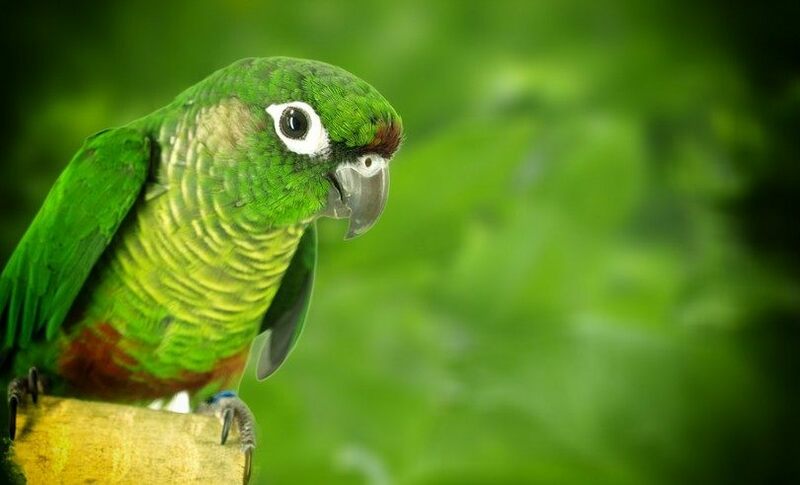 They are the smallest of the conure family and normally grow to be about ten inches long. In the wild, they are only found in South America. They come from Bolivia, Brazil, Argentina, and Paraguay. The green cheek conure lives in forests. Green cheek conures love hanging upside down in their cages. These birds love getting into mischief and are the clowns of the conure family. The fumes from cooking in non-stick pans can harm the green cheek conure. You can not feed a green cheek conure avocados because the fruit can kill them. They survive best in areas where the temperature is between 65 and 80 degrees Fahrenheit. Green cheek conures love the shower when it is turned on gently. They often bond with only one person but can also bond with other pets such as a dog or cat. Green cheek conures have a lifespan anywhere between 10 and 25 years. This is the same for all variations. The cinnamon mutation may not live as often to the upper age limit because they have a tendency of getting breathing problems. With proper vet care, they can live to about 15 years. The lifespan of this bird depends a lot on how well it is cared for. With only seeds for its diet, it won't live as long and a bird that doesn't have enough stimulation or room to play this could also shorten their lifespan. On average, most green cheek conures live to be 15 years old. The price of the green cheek conure depends on several factors. It can change depending on what country you buy the bird in, whether you get it from a private breeder or a pet store. The price also changes depending on whether you get a normal green cheek conure or are looking at one of the color variations. The rarer the variation, the more money you can expect to pay. On average, if you buy your bird in the United States and get him from a private breeder, you can expect to pay between $150 and $350 for the regular green cheek conure and between $200 and $500 for one of the variations. If you get a bird from a pet store you could be paying two to three times this price. There are rescue organizations who often have green cheek conures up for adoption and this is normally around $200 for an adoption fee. Keep in mind that these prices are only for the bird. You will also need to buy a cage, toys and food and pay for vet visits throughout your bird's life. The green cheek conure needs a varied diet in order to remain as healthy as possible. The majority of its diet is made up of seeds and special pellets made specifically for conures. You also need to feed it fresh fruits and vegetables. Every day you can put out a bowl of vegetables and fruit but make sure you throw away whatever is left before the day is over. These things can grow bacteria quickly and will make your bird sick if this happens. If you want to make your green cheek conure very happy, feed him bananas and raisins as a treat. These are his favorite. The most important thing is to make sure he has a lot of options and you do not give him the same thing every day or he will become bored. If you give your bird plenty of variety there should be no need to add vitamins to his diet. Female birds who are at the age to lay eggs may need extra calcium because their calcium supply is depleted quickly at this time. By putting a calcium cuttlebone in the cage you can give her the extra calcium she needs and help her keep her beak trimmed at the same time. The cage you get for your green cheek conure needs to be large enough for him to spread his wings without touching either side. It also helps to get one that is taller than it is wide because these birds love to climb. Include at least two wooden perches but three would be even better. A swing is always something fun for your bird as they can spend a large part of the day on it. Include a water dish and at least two food bowls. One food bowl for seeds/pellets and one for fresh fruit and vegetables. The cage also needs to be large enough for a bird bath bowl and a nesting box if you have a female that you will be breeding. Make sure you include plenty of toys in the play area. Some cages come with a play area on top of the main cage and this is ideal for your bird as it allows him to get outside of the cage. Change toys regularly so she does not get bored. Lastly, make sure at least one perch gives your bird room to hand upside down like it likes to do. Cinnamon - the red is brighter and the eyes are also red. Its head is a tan color. Yellow-sided - Looks much like the regular green cheek conure but has a bright yellow belly. Beak, feet, and eyes are dark in color. Pineapple - This is a combination of the cinnamon and yellow-sided. His head is the same color as the cinnamon but his chest is yellow. Suncheek - The head is a light color and its chest is a combination of yellow and orange. It has pastel green feathers and light blue flight feathers. The tail is bright orange and its eyes are red. Feet and beak are both white. Turquoise - This one is larger than the other types and it has light green feathers with a grey chest and grey tail feathers. Mint - This bird is a very light green and it has a silver head and platinum tail feathers. They have a large cage that provides plenty of room for flying and climbing. They need the exercise and are very active. The green cheek conure is a very clean bird so he needs either a bath bowl or some way to shower regularly. If you can't find a bowl for him to fit in, you can spray him gently with a spray bottle. Make sure you remove any bath bowl after he has finished. Letting the dirty water sit in the cage can invite bacteria to grow and make your bird sick. Give her plenty of toys to play with. Make sure they are different and don't forget to include some kind of puzzle toy to help keep her mentally stimulated. Clean the cage regularly to keep her home free of harmful germs. Spend time with your bird every day. They need to interact with their humans in order to bond and feel happy. These are very affectionate birds who love a chance to cuddle with people when they can. Make sure your bird sees a vet who specializes in birds at least once a year so you can catch anything that may be wrong early and get treatment. So starts today, and get a green cheek conure as a pet. Happy birding!